Fly Rasta is Ziggy Marley today; confident, soulful, and fun. 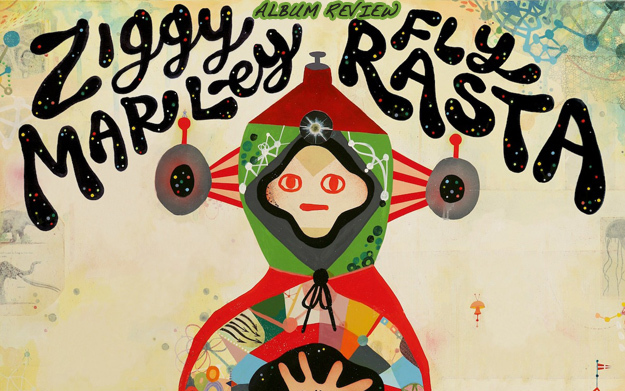 The cover art of Ziggy Marley’s Fly Rasta, his latest solo release, features what appears to be a rocket ship cloaked in a crazy-quilt of pattern and color. It’s an appropriate metaphor for a record that goes boldly where Ziggy hasn’t gone before, touching down for moments in alternative pop and acoustic rock, while retaining the reggae roots and spiritual and emotional evocations of past albums. It’s a progressive step for Marley, if not a giant leap. Teaming with Dave Cooley (Silversun Pickups, J Dilla) in producing the studio follow-up to Wild and Free, Marley’s 2011 effort, and coming on the heels of the icon’s Grammy win, his sixth, for last year’s In Concert, Ziggy’s change in direction seems part of a conscious effort to explore sounds that in previous work he has hinted at, but never fully examined. The opening bars of I Don’t Wanna Live on Mars offer enough evidence, with big, distorted guitar power chords juxtaposed with cleaner downstrokes, a marriage of rock and reggae set under a lyric that insists Earth is where we all need to be, has all we need, and he, for one, is not interested in an extraterrestrial bail-out from a distant planet. It’s a thought Marley doubles down on with an acoustic version as part of the Itunes release. The title song is magic, guest U-Roy’s toasts injecting an energy that Marley builds off of in reaffirming a specific spirituality that had been more subdued in recent times. Acoustic balladry dominates Lighthouse, its message of security and hope anchored by a pop-tinged backbeat and glossy production. It’s one song of several that carry an American flavor, that characteristic alone distinguishing itself in Marley’s discography. Making appearances throughout the record are Marley’s former bandmates from the Melody Makers- singers and sisters Cedella and Sharon Marley, as well as Rica Newell. They are but a few among many studio players and guests on the set, but their impact is perhaps greatest, adding a complementary strength and sound to songs that may otherwise coast. Here the tracks leap, pronounced harmonies and punchy vibrancy tying things nicely together. Additionally, Cedella, in a solo spot, joins her brother on I Get Up, a song in response to undisclosed personal issues from Ziggy’s recent life, a particularly noteworthy admission from the usually private singer. It is also a telling trait of the collection, one whose tracks from Sunshine and Moving Forward to So Many Rising seem to be reflective and cathartic, in contrast to the Technicolor world view of 2006’s Love is My Religion or political cynicism of Wild and Free. This record is less incite, more insight. Love remains a constant. Tributes to Ziggy’s wife in the form of You’re My Yoko, and to the emotion itself in Give It Away, confirm the reggae legend’s intentions, the message and messenger positive of this as the only real solution. Strong in voice throughout, there are instances where his tone turns raspy, expanded to its limits, and that, too, is analogous to what’s happening across the album. This is a 10-song experiment, part of an ongoing search for what can be said, done, and felt through the vehicle of music, and while much of it is vintage Ziggy Marley, enough of it is new, fresh, and risky to be provocative. Fly Rasta is Ziggy Marley today; confident, soulful, and fun, but with one foot on the ground and one on the platform, ready to board the ship and continue the quest. A final note: Marley has included wildflower seeds with each CD. It’s a gift that may be rendered largely symbolic as sales of physical discs continue to drop and downloads rise. It’s unfortunate, as the sweet, noble gesture could encourage the younger demographic to participate in an easy way to improve life of this planet. Too bad there is not an app for that.